The harbour foreshore with Queens Wharf on the waterfront and Christ Church Anglican Cathedral on the hill. 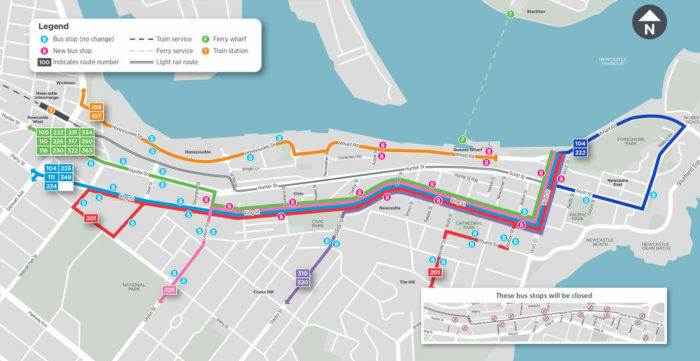 All the bus stops (including the 110 from Hamilton Station) have been moved from Hunter St. to either King St. or Honeysuckle Dr. All services are still the same, it just means when you get off the bus you’re on the other side of the block. The fare free zone is still operating too! So if you’re only going to areas on the map below, don’t tap on. For more info head to the Transport NSW website. It’s real messed up! With work on the light rail started and work on the SuperV8 race track in the East End behind schedule there are road closures and detours galore. Newcastle has never been known as an easy city to park in either. If you’re planning on driving, good luck! I’d recommend finding a well lit street in Hamilton and catching the 110 in. Newcastle Airport is 28km from the city centre and the drive takes about 35-40 minutes. The local buses are by far the cheapest option (only a couple of dollars) and run from the airport to the centre of town every 30 minutes or so. Remember Monday 1 October is a public holiday and buses will run on a weekend timetable. Also if you are arriving in the evening, buses are less frequent. Check out the airport website for more information. Note: Taxis to/from the airport can cost up to $70 each way(!). Remember that if you’re leaving on Monday, it’s a public holiday in NSW and taxis will be even more expensive. Plan ahead to avoid this – if you’re determined to take a cab, why not see if there’s someone else flying in/out around the same time and split the fare? Newcastle now has Uber, if you’re into that. If you’re Sydney-based or will be flying into Sydney from interstate the train is your best option. 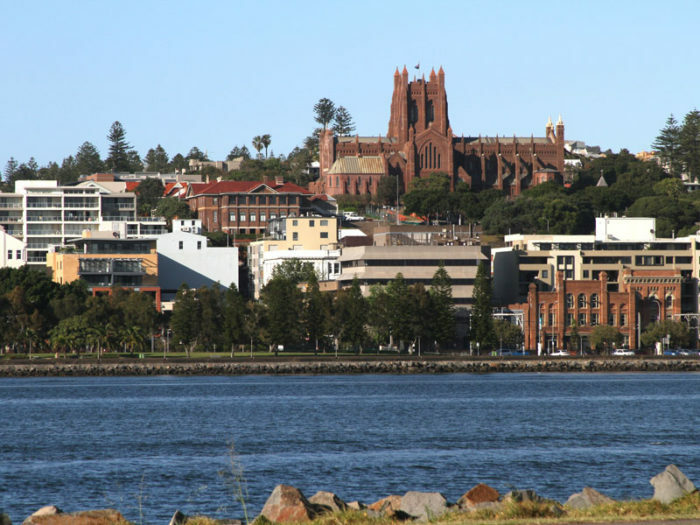 Flying into Sydney from interstate and then catching a train up the coast can be cheaper than flying to Newcastle direct and we encourage you to check out your options, particularly as the Newcastle Airport isn’t very convenient at times. Trains travel every hour from Sydney Central station to Newcastle (Newcastle and Central Coast line). It’s a scenic route, which winds around the Hawkesbury River and through Kuring-gai National Park. The entire trip takes about three hours (a little quicker if you can catch an express service) and is a good way to catch up on some reading! To make your journey extra fun, be sure to pack snacks. Call 131 500 or go to the Sydney Trains website for timetables and fares. You’ll need to get off at Hamilton station and catch the 110 bus into Newcastle itself. The train costs less than $10 for an adult one way at peak time (NOTE: there is a $15 surcharge on using the airport station). You may also consider buying an Opal Card this will save you money on fares. NSW TrainLink have trains which run through regional NSW. They also run to Newcastle from Brisbane, Canberra and even Melbourne. From some areas a train is much cheaper than flying. These trains are different to the intercity service which you’ll catch if you’re coming up from Sydney. Most importantly – they stop at a different place. If you’re catching the XPT you’ll need to get off at Broadmeadow station (also search for ‘Broadmeadow’ not ‘Newcastle’ when booking your ticket). From there you have a couple of options for getting into town. You can change onto an intercity train and catch it to Hamilton and then get the 110, you could get a bus (226) or get a taxi into the city. This is a much cheaper option than organising transport from the Newcastle airport. For more information head to the Transport NSW website. There’s heaps of cool places to grab a feed in Newcastle. Through the day there are more cafes than people (nearly), there are nice restaurants in Newcastle East, Hunter St Mall, Darby St and in Honeysuckle and pubs all over the place too. If you’re looking for food you can cook yourself, there are a few green grocers in the festival precinct but no supermarkets. The nearest shopping centre is Marketown in Newcastle West. Most buses go past it so just jump on one and ask the bus driver. The lock out laws that have been in place in Sydney over the last year or so is colloquially known as the ‘Newcastle Solution.’ Basically you can’t get take aways from bottlos or pubs after 10pm, no shots ever and there’s a lock out from 1am. We’ve tried to program more than one late night option each night but the latest we can go is midnight. On the bright side, there is no longer roving possies of drunken lunatics looking to beat your head in with their fists. No! Do not be afraid. This is just a survival guide so you DO have a good time while you’re at the festival. It’s going to be so mad. TiNA/NYWF attenders fill the streets both day and night it’s like some kind of bohemian utopia! and they’re all so friendly, just like you. If you do find yourself lost, confused and scared there will be both TiNA and NYWF volunteers wearing festival shirts roving the festival precinct with hugs, information and programs.